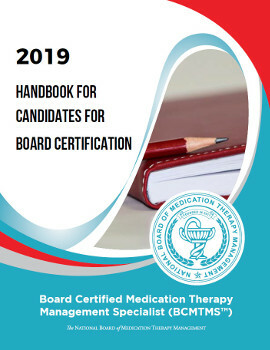 The Board Certified Medication Therapy Management Specialist (BCMTMS™) is a voluntary credential focusing on Medication Therapy Management with a distinct level of achievement beyond entry-level licensure. Pharmacists with the designated title BCMTMS™ demonstrate skills in handling complex patient care scenarios that can only be learned through experience and training which are actively sought out by MTM programs. Experience and Training: 2 years of MTM experience OR NBMTM-approved training OR degree in medication therapy management. Licensure: Hold an unrestricted pharmacist license. Education: Hold a Pharmacy degree. 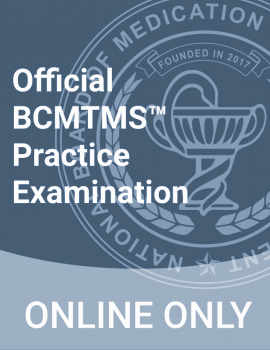 Certification Exam: Pass the exam for BCMTMS Examination. Professional Opportunities: a professional distinction that the healthcare industry demands and employers and consumers expect. Career Advancement: knowledge, expertise and professional experience needed to serve patients in the emerging models of care and patients with complex health challenges. Increased Credibility: competency to practice independently, promote quality and safety and protect the public. Board eligibility is necessary to participate in the certification process and sit for the BCMTMS examination. The application fee includes administrative and examination fees, and applies to all applicants. The path to certification is easy. You can proceed at your own pace in a self-directed manner.